Mehra Drora is a Dunmer priestess at the Temple in Gnisis. She offers ingredients, potions, spells, and spellmaking services to all who need them. She is a restocking vendor for the following ingredients: Bloat, Dreugh Wax, Fire Petal, Ghoul Heart, Hackle-Lo Leaf, Netch Leather, and Stoneflower Petals. She is a member of House Indoril, and, according to Gnisis citizens, not as unpleasant as most Indoril. She wears an expensive robe and common shoes, and carries the majority of her wares. 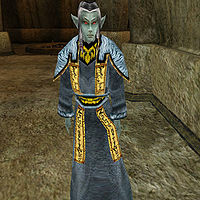 The Expensive Robe worn by Mehra Drora was used during the development of ESO when designing the sigil of House Indoril, despite the fact that it is a generic robe found on many other NPCs. The design on the gorget resembles a wolf, and this wolf symbol made its way into various art assets for many years before finally being noticed before the release of ESO: Morrowind in 2017.